Children 12 and under are admitted free when accompanied by an adult ticket holder. All military and dependents are admitted free with an official military ID. All military, honorably discharged veterans from all branches of service as well as family of those killed in action are provided free admission by requesting tickets online via Veteran Tickets Foundation. The designated drop-off location for disabled or handicapped spectators is at the Pro Shop parking lot adjacent to the main entrance. All items are subject to inspection (including metal detection) at the gate. All bags that are checked at the gates will be subject to search. 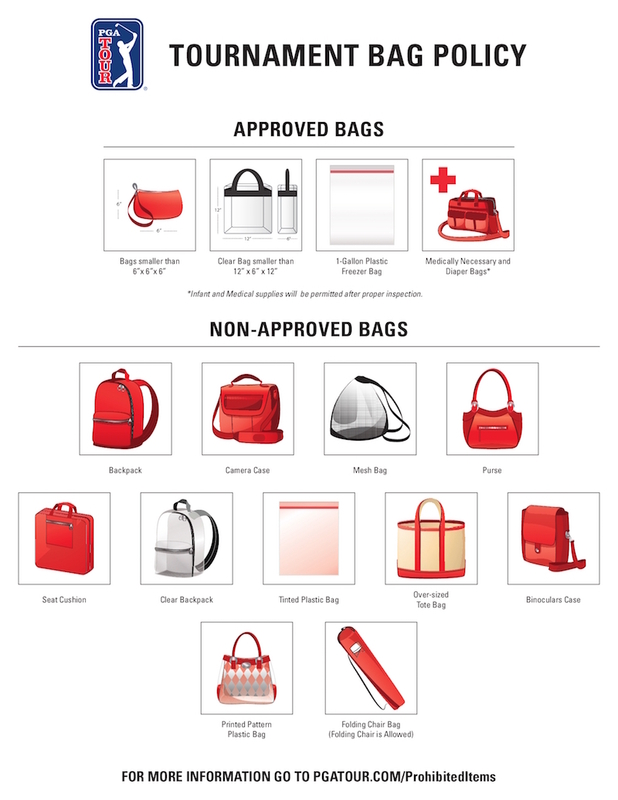 Please report any unattended bags to the nearest marshal or security officer. 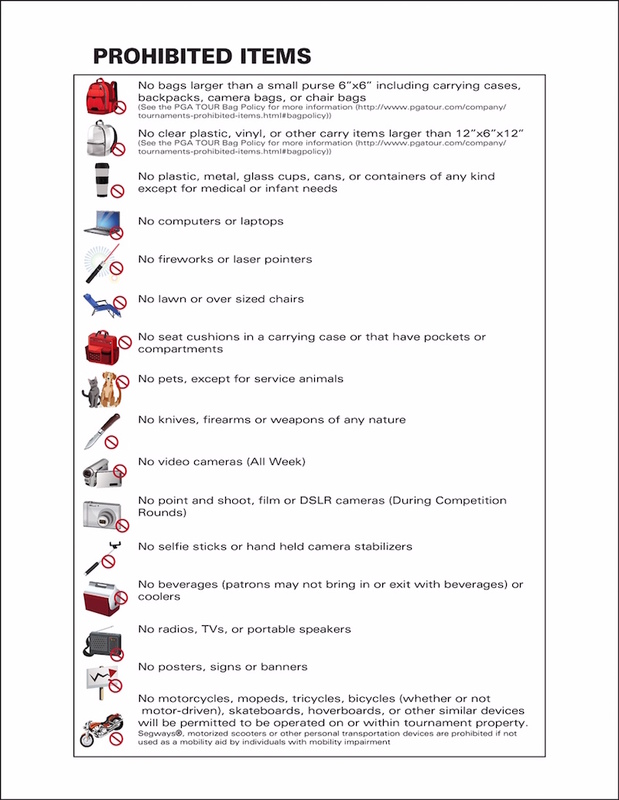 Any of the above listed Prohibited Items will be confiscated – leave them in your car. Effective immediately, spectators are now allowed to capture video, audio and photographs all week with their mobile device consistent with all posted rules and instructions of PGA TOUR and/or Tournament staff. However, you may only use such content for personal, non-commercial purposes (e.g., for your personal social media accounts) , and you may not distribute such content on a live or near live basis (no live streaming). Receiving or placing phone calls will remain limited to designated “Cell Phone Zones.” As a reminder, cameras are NOT allowed during official rounds. Device must be on silent at all times. Data use (e.g., texting, email, etc.) will be permitted outside of the designated “Cell Phone Zones” all week. Data use is not permitted when players are in position to compete (i.e., when QUIET PLEASE paddles are raised). Failure to adhere to this Mobile Device Policy may result in the confiscation of your mobile device or removal from the tournament. Leave behind your backpacks, cameras (Thurs – Sun. ), and bags. 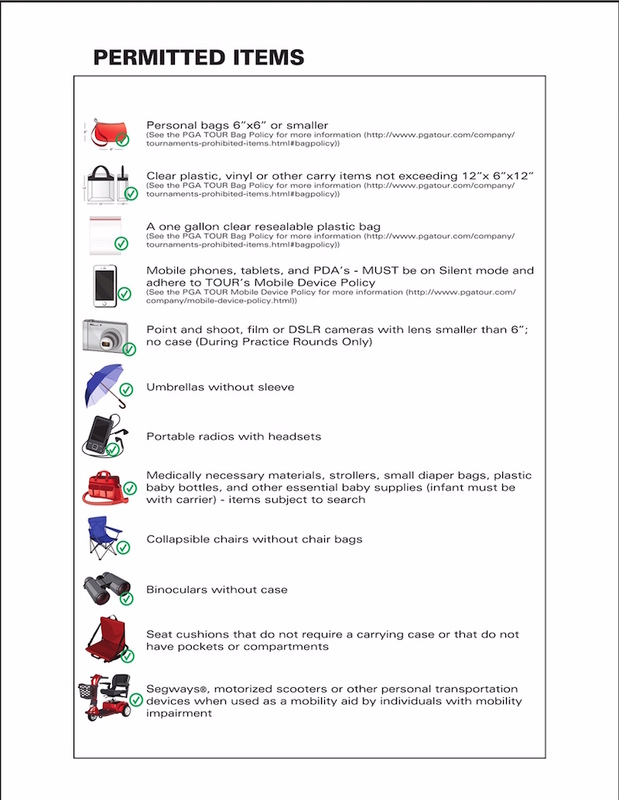 No opaque bags larger than 6” x 6” x 6”; no clear tote bags, plastic, vinyl or other carry items larger than 12” x 6” x 12" will be allowed.